Non-medicinal ingredients: dextrin, maltodextrin, tapioca starch, tricalcium phosphate. AOR™ guarantees that all ingredients have been listed on the label. Contains no wheat, gluten, peanuts, sulphites, mustard, soy, dairy, eggs or shellfish. Raw material processed in a facility that contains, nuts, sesame seeds, and fish. Suggested Use: Take 2 scoops daily with food. For each scoop, mix with 200ml of liquid (water, milk, fruit juice or similar aqueous beverage). Stir briskly and drink immediately. If you are on antibiotic(s), take at least 2-3 hours before or after. Caution: Caution in individuals with gastrointestinal lesions/ulcers, individuals taking anticoagulant agents, anti-inflammatory agents, are having surgery, following a low protein diet, or if you have fever, vomiting, bloody diarrhea or severe abdominal pain. Caution in prolonged use. Discontinue use and reassess if symptoms (e.g. digestive upset, diarrhea) occur, worsen, or persist beyond 3 days. Hypersensitivity/allergy has been known to occur; in which case, discontinue use. Do not use in individuals that have an immune-compromised condition (e.g. AIDS, lymphoma, patients undergoing long-term corticosteroid treatment). What is Pro GI Repair? 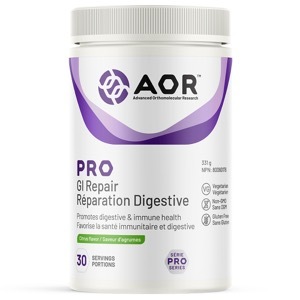 AOR's Pro GI repair is a comprehensive formula that includes: the shelf-stable probiotic, Bifidobacterium longum (BB536); enzymes to digest allergenic proteins; proteases from A. niger & A. flavus var. oryzae; L-glutamine as fuel for enterocytes; and the calming, healing nutrients, ginger (Zingiber officinale 10:1), zinc L-carnosine, and deglycyrrhizinated licorice extract (Glycyrrhiza glabra 6:1). This evidence-based, hypoallergenic formula was developed in order to calm gastrointestinal inflammation, repair intestinal permeability, and improve digestion. It is beneficial for individuals who have suffered from long standing inflammation of the gastrointestinal tract, such as: food sensitivities or allergies, irritable bowel syndrome (IBS), irritable bowel disease (IBD), chronic infections, gastro-esophageal reflux disease (GERD), and other gastrointestinal problems. Pro GI Repair also contains protease enzymes to help digest proteins, and probiotics to promote a favorable gut flora. AOR created this unique formula exclusively for healthcare professionals, as it is becoming more and more apparent how imperative proper gut health is to overall health. This multi-targeted formula helps address the common concerns that many healthcare practitioners see in their clinics, in a safe and effective manner.